Facebook Has Automatically Signed You Up for Facial Recognition. Here’s How to Opt Out. 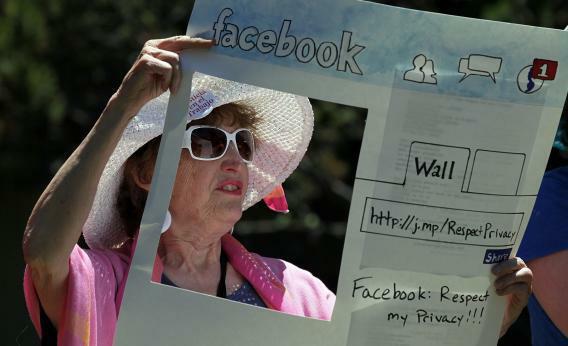 Gail Sredanovic of the activist group Raging Grannies protests outside of Facebook’s former Palo Alto headquarters in 2010. Now that we know Facebook is about to get a lot better at recognizing our faces, what can we do about it? If you’re the sort of person who wants your friendly social media company to get to know you as well as possible, I have good news: You don’t have to do anything at all. Facebook signs you up for facial recognition by default, so all you have to do is sit back and let your friends teach the company’s algorithms exactly how to identify your face in their photos. In fact, there’s a good chance this is already happening, since Facebook was using some of Face.com’s technology even before the acquisition. If, on the other hand, you still cling to quaint notions about privacy and anonymity, the news is mixed. There’s no way to stop Facebook from learning what you look like based on the photos in which you’re tagged, and if you haven’t already opted out, it may know your mug pretty well already. But you can easily opt out of the feature in which Facebook uses that information to make your name pop up whenever your friends upload a photo of you. I assume the question is rhetorical. As I’ve argued before, Facebook has already done the hard work of making itself valuable to its users. Its big challenge now is to make its users valuable to its investors. We don’t know yet exactly how Facebook will monetize facial recognition—no doubt it will have to tread carefully. Regardless, it’s clear that making the feature “opt-out” will result in a much better and more extensive database than the company would get if it asked people to opt in, as Google+ does.